Glacier National is all about hiking. 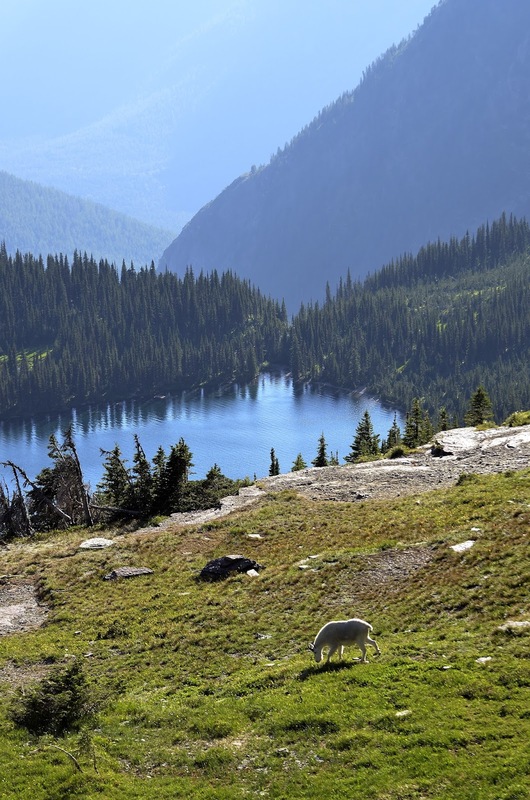 One of the most popular hikes is to Hidden Lake. It is a pretty easy hike and you are almost guaranteed to see Mountain Goats. These guys are seem very tame. You can get pretty close. And I did. After I got all my portrait work done I started looking around. This guy was off in the field by himself. I liked the fact that the lake was in the background. That is what I saw and what I was looking for. Once you get the "shot" that everyone else is getting - look around. You just might see something that no one else did. When you go to Glacier this hike is on the list. It is right from the top of Logan's Pass. If you can get in the parking lot - do this. Either go early in the morning or late in the evening. We went in the evening.